Recent release “Spiritual Man: Natural Woman” from Page Publishing author Evelynn LaVerne Johnson is a Bible study focused on the invaluable roles women play in Christian life. Evelynn LaVerne Johnson has completed her book “Spiritual Man: Natural Woman”: an exploration of the joys and responsibilities of womanhood as affirmed in Scripture. Johnson shares, “’Spiritual Man: Natural Woman’ is an empowerment and relationship-building Bible study written to reveal and remind young, middle-aged, and mature women of faith that we do not have to ask for liberation or equality because we already possess it. The key to experiencing the joy of womanhood lies in our individual and collective abilities to learn what acceptable and unacceptable relationships with each other and the men in our lives look like from the women of the Bible. 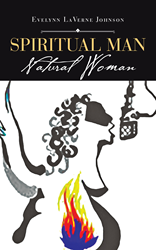 "‘Spiritual Man: Natural Woman’ brings attention to the fact that as women, we have the same responsibility as men to learn to worship the Father in Spirit and in Truth. ‘Spiritual Man: Natural Woman’ also holds us accountable for learning and evolving into the specially designed help meet (daughter, sister, aunt, niece, cousin, mother, wife, and friend) our sons, brothers, uncles, nephews, cousins, fathers, husbands, and friends can share with, learn from, and be willing to protect, support, and grow with. As women of faith, we must be mindful of how we respect one another as we move forward in our efforts to be respected by men. Published by New York City-based Page Publishing, Evelynn LaVerne Johnson’s book is an empowering and relationship-building study of God’s word in the Bible. Readers who wish to experience this affirmational work can purchase “Spiritual Man: Natural Woman” at bookstores everywhere, or online at the Apple iTunes store, Amazon, Google Play, or Barnes and Noble.